The Ferrari 458 Italia is a mid-engined sports car produced by the Italian sports car manufacturer Ferrari. The 458 replaced the Ferrari F430, and was first officially unveiled at the 2009 Frankfurt Motor Show.It is now being replaced by the Ferrari 488 GTB, which was unveiled at the Geneva Motor Show 2015. 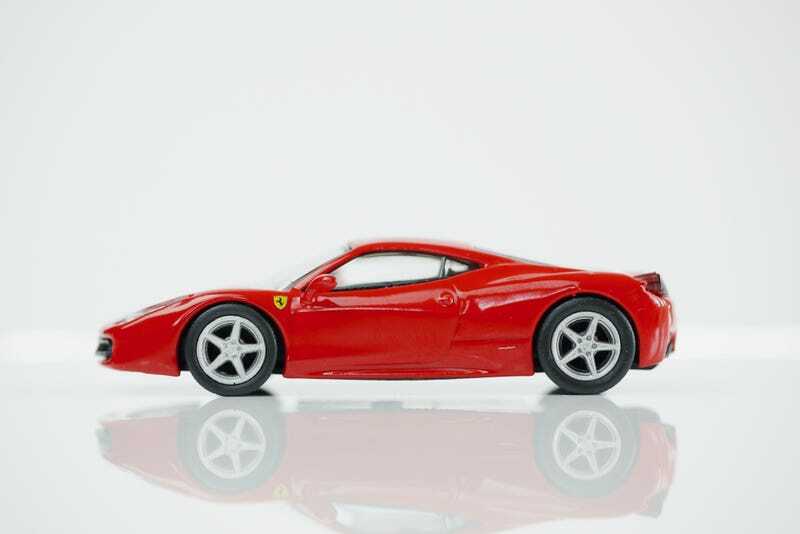 In Ferrari’s first official announcement of the car, the 458 was described as the successor to the F430 but arising from an entirely new design, incorporating technologies developed from the company’s experience in Formula 1. The only transmission available on the 458 is a dual-clutch 7-speed GETRAG gearbox, in a different state of tune shared with the Mercedes-Benz SLS AMG. There is no traditional manual option, making this the fourth road-car after the Enzo, Challenge Stradale and 430 Scuderia not to be offered with Ferrari’s classic gated manual. It is the first mainstream model to not be offered with a manual transmission. The car’s suspension features double wishbones at the front and a multi-link setup at the rear, coupled with E-Diff and F1-Trac traction control systems, designed to improve the car’s cornering and longitudinal acceleration by 32% when compared with its predecessors. The brakes include a prefill function whereby the pistons in the calipers move the pads into contact with the discs on lift off to minimize delay in the brakes being applied.This combined with the ABS and standard Carbon Ceramic brakes have caused a reduction in stopping distance from 100–0 km/h (62-0 mph) to 32.5 metres (107 ft). Tests have shown the car will stop from 100 km/h (62.1 mph) in 90 feet (85 with run flat tires), 85 feet from 60 mph (97 kmph) and 80 feet from 60 mph (97 kmph) with run flat tires. Ferrari’s official 0–100 km/h (62 mph) acceleration is 2.9-3.0 seconds. The top speed is 340 km/h (210 mph). It has fuel consumption in combined cycle (ECE+EUDC) of 13.3 L/100 km (21.2 mpg-imp; 17.7 mpg-US) while producing 307g/km of CO2. The small aeroelastic winglets generate downforce and, as speed rises, deform to reduce the section of the radiator intake and cut drag. In keeping with Ferrari tradition the body was designed by Pininfarina. The car’s exterior styling and features were designed for aerodynamic efficiency, producing a downforce of 140 kg (309 lb) at 124 miles per hour (200 km/h).In particular, the front grille features deformable winglets that lower at high speeds, in order to offer reduced drag. The car’s interior was designed using input from former Ferrari Formula 1 driver Michael Schumacher; in a layout common to racing cars, the new steering wheel incorporates many controls normally located on the dashboard or on stalks, such as turning signals or high beams. The 458 was also reviewed on the 15th season of Top Gear, where it received acclaim for its styling and performance. In a drag race against James May’s Ferrari F430, it won by a considerable margin. The car also lapped the Top Gear test track in 1:19.1, just 0.1 seconds slower than the Ferrari Enzo. The 458 is not one of my favorite cars but it is a legitimate Ferrari. Kyosho has done a reasonable job recreating the design. I am not all that happy with the casting as it feels a bit chunky to me. The details paint are all Kyosho standard.